An ambrotype from the Ray Shytle family pictures an ancestor, Pvt. John T. Shitle of the 48th North Carolina Infantry, who was mortally wounded and captured at Antietam. The editor introduces this all-Confederate issue with a focus on the Trans-Mississippi, courtesy of the collection of Dr. Tom Sweeney, proprietor of “General Sweeney’s Museum” in Republic, Mo. The letters to the editor includes praise and comments about the recent all-navy issue and a mention of the Anthony Company and their “early reproductions” of cartes de visite. Five publications are mentioned, including A Dose of Frontier Soldiering: The Memoirs of Corporal E.A. Bode, 1877-1882 (University of Nebraska Press) edited by Captain Thomas T. Smith, An Introduction to Civil War Civilians (Thomas Publications) by Juanita Leisch, The Confederacy’s Forgotten Son (Rockbridge Publishing) by Harold Woodward, and more. A survey of 56 images, most from General Sweeney’s Museum in Republic, Mo., is divided into subsections that include a general introduction (4 images), A Gallery of Generals (13 images), Confederates in the Indian Territory (6 images), The Missouri State Guard (9 images), Western Cavalry and Partisan Rangers (7 images), Foot Soldiers (10 images), Gunners (4 images) and Into New Mexico at War’s End (3 images). This variation of the well-known view of Capt. Raphael Semmes leaning on the barrel of a Dahlgren gun pictures an unidentified officer in the foreground and the crew behind him. The print is owned by Roger L. DeMik, a Tennessee attorney and collector who specializes in Confederate naval history. Two letters by Malone, one dated Aug. 10, 1864, in the trenches near Atlanta, and another dated April 15, 1890, from Capelville, Tenn., anchor his profile. He and his comrades volunteered from their homes in DeSoto County, located on the Mississippi/Tennessee border not far from Memphis, Tenn. A wartime photo of Malone illustrates the text. A sampling of nine images from Mast’s new book on North Carolinians at war, the first of two volumes. It is expected to be released at the end of the year. All of the featured portraits are identified soldiers, each accompanied by a biographical sketch. They include William Wallis McDowell of the 1st Infantry, James Madison Ragland of the 46th Infantry, John William Mercer of the 1st Cavalry, and others. A study of 8 portraits of mostly Southern soldiers displays a variety of elaborately patterned shirts. In “The First South Carolina Rifles (Orr’s Regiment),” McAfee focuses on the regiment’s history. The text is illustrated with a carte de visite of William E. Round of Company B. A wartime copy-print by Webster of Binghamton, N.Y., Round’s connection to the Empire State is not known. Billed as “Solo images of Southern soldiers brought together for this Confederate issue,” the grouping includes 7 portraits. Three of the soldiers, all infantrymen, are identified: Saunders Myers of the 4th Florida, John David Walker of the 1st Georgia and Amasa V. Going of the 12th Louisiana. 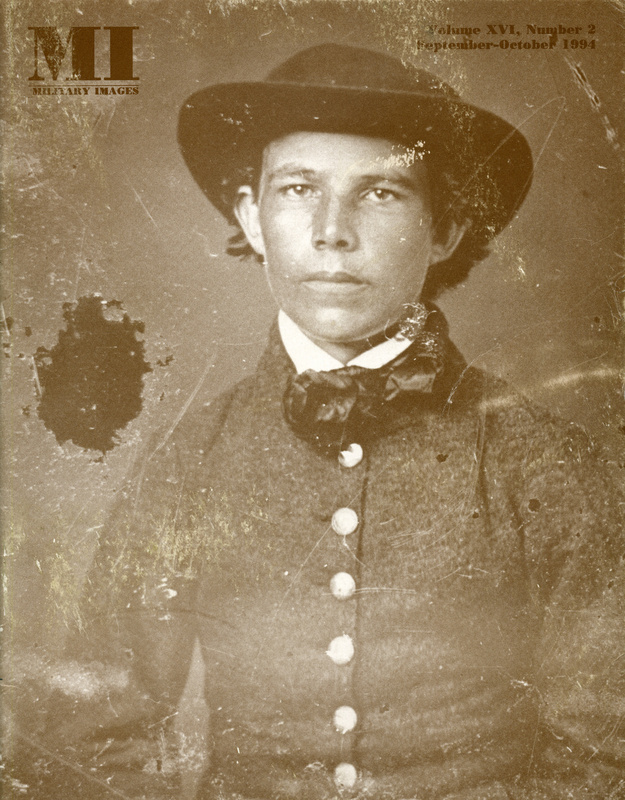 A sixth-plate ambrotype by an anonymous collector is a portrait of a North Carolina infantryman.